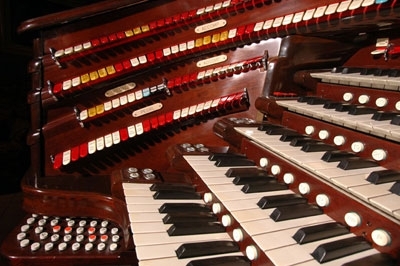 Theatre Organs, for those who do not know them, are not the same as the other pipe organs. The principles are based on pipe organs. Theatre Organs, however, provide a much wider range of sounds. If we look at the origins, we will be able to understand the way these incredible instruments evolved. It will also give us an insight into their fall. The rise of the Theatre Organs is contributed to the early silent movies. These movies were missing any kind of sound track and relied on local orchestra to provide the sound effects. People would sing along with the movie, and it was truly an interactive adventure. As you can imagine, not each theatre was able to afford a full orchestra every night. Here enters the "Mighty Wurlitzer". A Theatre Organ that was miles ahead if its time. The power of this organ was in the fact that a single person could produce a variety of sound effects. The variety was wide enough to accompany the silent movies. While they were not cheap even back then, they did weigh out the cost of a full orchestra. The configuration may vary from a model to another. The sounds that could produce varied from flutes to trumpets, violins to clarinets, oboes etc. There is often an impressive list of tuned percussions like chimes and pianos. There were a number of sound effects that were necessary in the movies. These include doorbells, horns, birdcalls etc. Click Here to view our range of stock. By the time the "talkies" arrived, Theatre Organs had firmly established themselves. The "talkies" were movies with dialogue and music. They are obviously could not compete with the dialogues within the movies, and eventually the precise thing that energized their rise became the cause of their demise. In the late 1930's, Theatre Organs were torn down and vandalized. A few survived this brutal age. Today entire societies are formed around these amazing instruments. There are scholarships given to learn this special musical instruments. People fly across the globe to attend legendary performances. It would not be terribly unfair to compare the them with dinosaurs that do not cease to fascinate us till date. The number of Theatre Organs in the world is limited. They can be called rare species. The people who can play these instruments are equally rare. Famous people have joined leading societies across the globe to salvage the remaining ones. There are many online videos and audio clips made with this special musical instruemtns, which one can hear. Theatre Organs were an remarkable feat of musical variety in the early 1900s. Their rise and fall was in a relatively short span. The closest thing to them, in modern times, is the synthesizer. Electronic synthesizers can plan a variety of instruments on the same keyboard. They achieved that mechanically, half a century before. Should you ever get a chance to see Theatre Organs in action, make sure you attend the performance. It will be a performance you will refer to and remember for a long time.